Oh where to get started on all the things I love about these cookies! First off they are not your typical complicated gluten-free baked good that requires 4 different flours and xanthan gum. The base is simply made of oats you grind up in your blender! Three cheers for clarity in the confusing world of gluten-free baking! These cookies are so delicious! 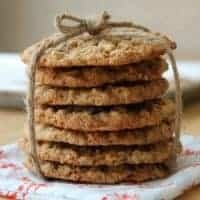 They are what you would expect from a lacy oatmeal cookie, with crispy edges and a chewy center. I love the salty toffee paired with the bittersweet chocolate. And the hint of cinnamon makes them perfect for this time of year in my opinion. I made these for a function at Nate’s office and every last cookie was eaten! 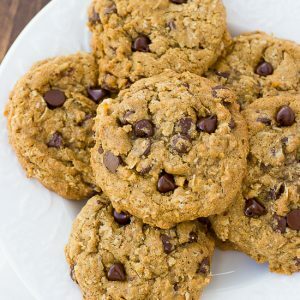 Thin, crispy, and buttery oatmeal cookies with toffee and chocolate. Preheat oven to 350. In a blender, process 1 1/2 cups oats into a fine meal. Whisk together ground oats, cornstarch, cinnamon, baking powder and salt. In a large bowl, using a mixer, beat butter and sugars until light and fluffy. Beat in eggs and vanilla. With mixer on low, gradually add oat mixture, beating until combined. Fold in chocolate chips, toffee bits, and remaining 3 cups oats. 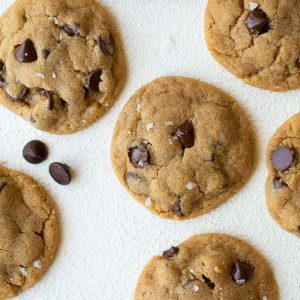 In batches, drop dough in 1-tablespoon mounds onto a parchment-lined baking sheet, 2 inches apart. Bake until cookies are golden brown at edges, 12-15 minutes. Let cool on sheet on wire rack 2 minutes, then transfer to rack and let cool completely. Enjoy! These look awesome! I always to cook healthy (or healthier) sweets but get turned off by all the foreign looking ingredients. I just read through that ingredient list and I have everything already in my kitchen (well except for the gluten-free baking powder and oats). They look delicious! Wow. 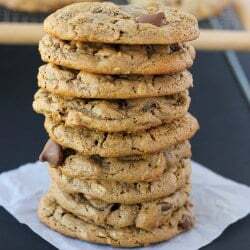 This cookie recipe looks fantastic! I definitely will try these soon. I see, It seems tasty. It seems like there's some liquid missing from this recipe. I followed it to a tee and they were crumbly and fat. I added an extra egg and some almond milk and they were much better.